Socializing your dog with other dogs is tricky! If you don’t do it right, you could be speeding down the road to your vet hospital to have him stitched up! It isn’t rocket science, but there are some common mistakes that people make that set their dogs up for failure and put them at risk! Read and share this list to make sure you and your friends aren’t making these mistakes. I know that sounds silly, but you would be surprised how many people get a new dog, and after a few days, pack him up and take him to the dog park. They notice the dog has a lot of energy and so their default idea is to take that dog somewhere to play. The problem is that not all dogs like to socialize and play with other dogs. Even fewer dogs like playing in big groups of dogs they don’t know. I suppose it would be like taking an introvert to a dance/nightclub and turning them loose. Some people are social with everything, and some people are quieter and prefer a few close friends. Get to know which your dog is before you stress him out by turning him loose with dogs he might have a conflict with. This is another BIG mistake! I can’t tell you how many people tell me how much their dog typically likes ALL dogs, except for the exception and then the dog is barking, and lunging, and pinning dogs at the dog park. On occasion, these owners admit that their dog has sent a dog or two to the vet to be stitched up. Yet, they are adamant that their dog LOVES the dog park and gets along with most dogs. It always kind of stands the hair up on the back of my neck. Would I want to let MY dog play with that dog? Would you want to let YOUR dog play with that dog? I mean, how can you tell which dog will be liked and which dog will be wounded? If your dog is giving ANY mixed signals, GET HIM OUT OF THERE!!! If he is scared, if he is aggressive, he is giving you information that you need to take seriously. And, if it happens more than once, chances are this situation is causing more harm than good, and your dog is learning bad behavior, or being traumatized. 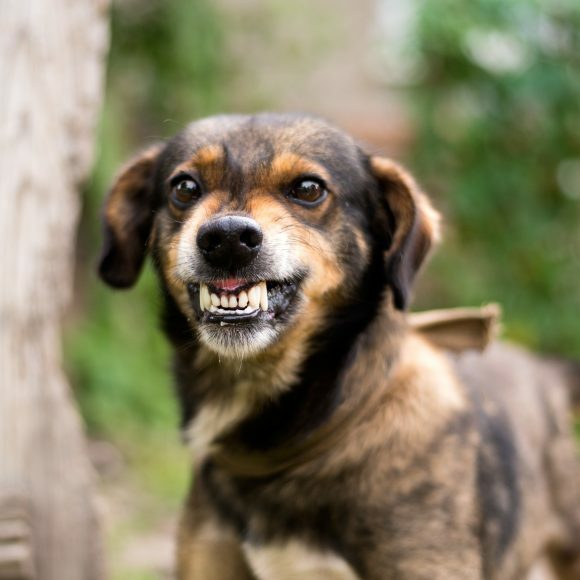 Even though your dog can’t talk and tell you how scared he is, or how sharing, and other dogs in his face make him angry, he is trying to tell you the same thing through his behavior. Please LISTEN TO YOUR DOG!! If he is giving you mixed signals, he isn’t comfortable all of the time, and perhaps you should find another way to exercise him. I can’t make it any more clear… not all dogs want to socialize with other dogs. Some were never socialized when they were trained as young puppies, and they don’t understand, or never learned, doggy social behavior. Others may have had bad experiences. Some of us are just introverted and don’t like other people in our faces. Just like I don’t want to be at a club or big party, your dog may not want to play with a lot of dogs. Start by finding ONE dog that you know likes other dogs. Dog parks are scary places! Just like I mentioned before, too many people are taking dogs that they know are aggressive and have had numerous bites. And, if that is not bad enough, the rest seem to just release their dog and never look up from their phone again. Years ago, people used to play with their dogs and pay attention to their behaviors. 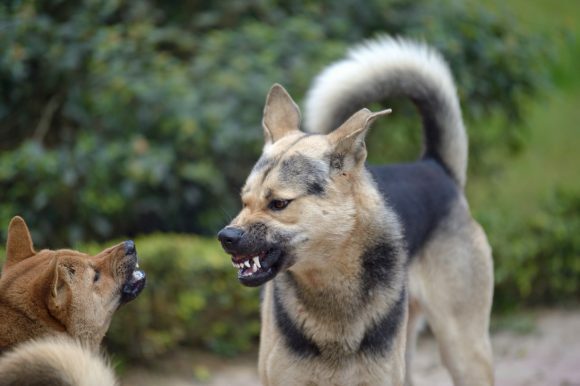 Back then, they would step in if their dog acted aggressively, or even bullied another dog. Nowadays, no one even notices. 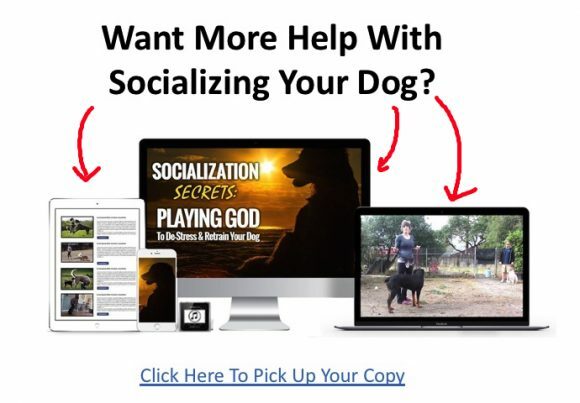 If you want your dog to socialize and play with another dog, you should find a friend or family member that has a social dog. At the very least, you should find a GOOD daycare facility that is careful and knows about dog behavior and socialization. I prefer that these facilities have cameras so that you can make sure your dog is playing safely. Otherwise, many places will just keep aggressive dogs or fearful dogs in their crate or run while not allowing them to play, and then lie and say they have played all day. If you can see it with your own eyes, you will know if your dog can play appropriately. Yes, this is just like the example above, except your dog’s life and safety is at stake. 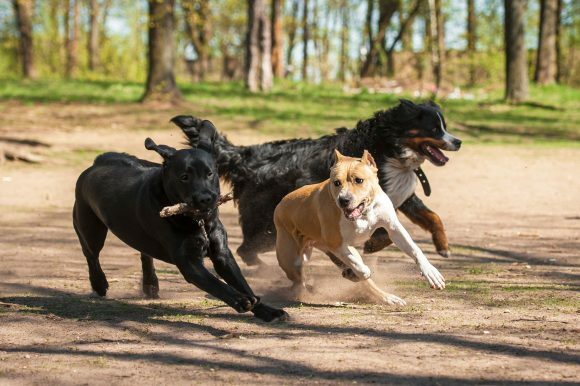 If there is another dog at the park, at your friend’s house, or in daycare who is growling, or barking and lunging, or showing any aggressive behavior, pack your bags and get out. Again, so many people ignore their dog’s bad or aggressive behavior. You can’t expect someone else to care about YOUR dog’s safety. If you are uncomfortable, leave. You don’t have to explain it or say anything, just remember the aggressive dog is trying to give people information. Take that information and keep your dog safe. This is one of my major pet peeves. They should not be playing with other dogs. And, dogs get caught in metal collars. I have seen one dog accidentally bite another dog’s choke chain while playing and the tooth gets stuck. Then the dog whose tooth is stuck, panics and tries to get away. At this moment, he is likely about to choke out the dog wearing the collar. Many times, these collars need to be cut off! Don’t allow your dog to get stuck in another dog’s collar, and definitely, don’t leave a metal collar on your dog! As much as I hate to say it, a small dog playing in a group of large dogs is at significant risk. Even if, individually, the big dogs are good with small dogs in a group, that could change. Dogs in a group become a pack. A lone dog won’t do things that he will do in a group. Just like a good teenager is likely to do things they wouldn’t normally do when they feel peer pressure. The dogs can’t help it. In some ways, it is all about instinct. If you have a small dog and a bunch of large dogs show up, I would recommend leaving. All it takes is one moment when the pack decides to chase the small dog, and things can take a turn for the worst. Dogs don’t have to be social with other dogs to be good pets. So many people think that they are bad owners, or their dogs are bad dogs, if the dog doesn’t PLAY with other dogs. Not all dogs want to play. We shouldn’t force dogs that don’t want to play, to play. Instead, we can teach our dogs how to behave appropriately with other dogs by not engaging them but by being obedient and showing respectful behavior. However, both of them can be in large groups of other dogs. It doesn’t make them “less” of good family dogs or good pets because they don’t’ want to go to the dog park and play. And, likewise, it didn’t make my playful dogs “better” dogs because they wanted to play. If he wants to play with every dog, let him. If he doesn’t want to play, don’t force him. As long as you show good behavior around other dogs, that is all that matters! The long and the short of it… is that you shouldn’t force and you shouldn’t expose your dog to dogs you or a professional doesn’t know! It is better to have a dog that is well behaved and respectful than a dog that is playful!